A hand-drawn king needs an impressive crown to top off his royal raiment. The crown sets him apart from ordinary citizens. The royal crown should have a strong presence of precious jewels and a heavy silver or gold foundation. 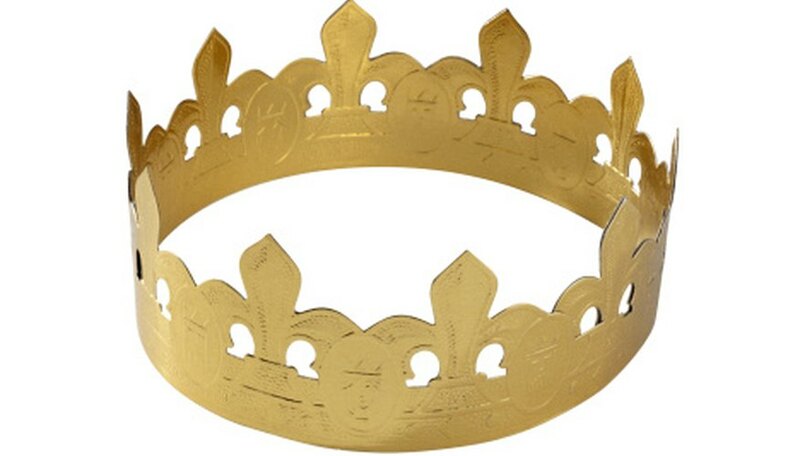 The crown fits around and down over the head to settle just above the ears of the wearer. You can draw a thin everyday circlet with simple ornamentation or a regal crown fit for a celebration. Draw a set of dots on the drawing paper with a pencil for guides for each side of the head. Line a third dot halfway between the two side points at a slightly lower point on the paper. This allows for a dip in the curve. Draw a curved line from the first dot through the third dot and on to the second dot. Make a halo or oval shape by returning in an upward curve from dot two to dot one. Draw a second halo shape above the first oval shape. The bottom of the top halo will be drawn through the top of the bottom halo, creating a third oval shape in the center of both shapes. Go over the front of the bottom line and topmost line of the overall drawings with the pencil. This is the top and bottom outline of the front of the crown. Draw an oval or diamond shape in the center of the top of the crown front. This can be drawn up above the lines that have been previously drawn for a high crown point. Draw the up-curved line of the back of the crown. Erase all unnecessary lines with the kneaded eraser. Lightly sketch in jewel shapes and ornate trim and peaks around the front of the crown. When you are satisfied with the shapes and location of the jewels, go back and fill them in with darker outlines and details with a sharpened pencil lead. Use a dull pencil lead for shading in more details. Fill in the back of the crown with dark shadowing.